Each rune was a sigil of some supernatural power and to write a rune was to invoke and direct the force for which it stood. Runes were traditionally carved onto stone, wood, bone, metal, or some similarly hard surface rather than drawn with ink and pen on parchment. There’s no such thing as too much dice. For RuneQuest one more die will be not enough, three dice sound better. One big die and two normal beautiful dice sound awesome. Doesn't it? The set is composed of one giant d20 Hit Location die, one d12 Strike Rank Indicator and one d20 Random Rune Generator. These dice are a tribute to RuneQuest. This is a precious D20 made out of real Howlite-stone. It comes with an uniquely engraved wooden chest that looks like a small book. This box is equipped with a foam inlay to protect the D20. Twelve iridescent dice in three fruity colors inspired by the Fate Core theme. A Pegasus with the power of flight? An Earth pony whose heart is stout and proud? Or are you a Unicorn with mysterious powers? Whatever pony you play there is a dice set for you! 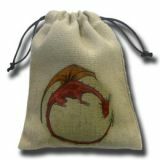 Each dice set contains 6 roleplaying dice and a unique mini-adventure, not available anywhere else. Perfect to enhance your Tails of Equestria experience. Amulets, from the psychological point of view, help focus in struggle with stress, madness and nervous breakdowns. In Pathfinder Strange Aeons Dice Set (7) Q-Workshop gives his clients seven amulets in form of dice. This set is dedicated to Pathfinder RPG Adventure Path Strange Aeons. These six chapters long campaignis tribute to the works of Philip Lovecraft and his universe of Cthulhu Mythos. Dice are made of the high quality green plastic. In many opinions, the green color calms down and helps catching breath under stress no matter how big it would be. Sadly, the project was sabotaged by the cultists. They have corrupted the background with sick yellow, very distinctive engravings: ciphers, signs of ave for blasphemous Old Ones and tangled tentacles. All these symbols are so durable that even deep polishing helped nothing. Q-Workshop admits that this new twisted look has its charms, so they humbly offer them to gamers for evaluation. Maybe the Sign of King in Yellow will help them better immerse in the world of wonderful insanity during successful adventures. Yet again, Paizo Inc. decided to collaborate with Q-Workshop to craft this masterpiece dice set, featuring seven polyhedral dice: K4, K6, K8, K10, K12, K20, K100. Beautiful engravement and azure/yellow colorway make them even more eye-catching. Take part in an incredible story full of monsters, magic and artifacts. 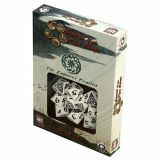 Use this Pathfinder RPG dice set and enhance your gaming experience. Four translucent Fate Dice™ of red, with yellow ink. Just the right number for a single player. When it comes right down to it, these are dice that you can display proudly alongside all the other fancy dice in your collection (we know you have one) giving your Fate and Fudge games an extra dose of style. Top to bottom, these are Fudge Dice reimagined—Fate Dice™! Seasoned veteran of many a melee, Grakk knows how to bring the maximum pain to any hand-to-hand battle. This set of radioactive green dice has been blessed by the War AIs themselves to ensure maximum damage when rolled in any combat on Terra A.D. Contained within this tube you will find these dice, ready for rolling on your table: D3, D4, D5, D6, D7, D8, D10, D%10, D12, D14, D16, D20, D24, and D30. Game on! Seconds in a minute? Minutes in an hour? Or maybe you just need a handy way to track numbers from 1 to 60? Either way, this unique novelty will amaze your friends! This die is made from red opaque plastic with white numbers, packaged in a clear plastic bag with cardboard header. Seconds in a minute? Minutes in an hour? Or maybe you just need a handy way to track numbers from 1 to 60? Either way, this unique novelty will amaze your friends! This die is made from white opaque plastic with black numbers, packaged in a clear plastic bag with cardboard header. Seconds in a minute? Minutes in an hour? Or maybe you just need a handy way to track numbers from 1 to 60? Either way, this unique novelty will amaze your friends! This die is made from green opaque plastic with white numbers, packaged in a clear plastic bag with cardboard header. Seconds in a minute? Minutes in an hour? Or maybe you just need a handy way to track numbers from 1 to 60? Either way, this unique novelty will amaze your friends! This die is made from blue opaque plastic with white numbers, packaged in a clear plastic bag with cardboard header. Seconds in a minute? Minutes in an hour? Or maybe you just need a handy way to track numbers from 1 to 60? Either way, this unique novelty will amaze your friends! This die is made from black opaque plastic with white numbers, packaged in a clear plastic bag with cardboard header. This is a 7 Dice Polyset made of solid metal. 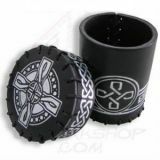 The die are colored in Gun Metal and are of great use in every roleplaying or other dice games. They also work as strong and precious counters in card games. This set is produced at a very high quality-level to offer a unique and beautiful dice product. The set is safely protected in a foam-filled tin-box with an attached lid. This is a 7 Dice Polyset made of solid metal. The die are colored in shiny gold and are of great use in every roleplaying or other dice games. They also work as strong and precious counters in card games. 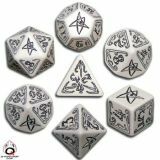 This set is produced at a very high quality-level to offer a unique and beautiful dice product. The set is safely protected in a foam-filled tin-box with an attached lid. This is a 7 Dice Polyset made of solid metal. The die are colored in shiny copper and are of great use in every roleplaying or other dice games. They also work as strong and precious counters in card games. 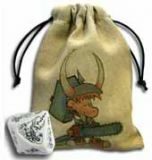 This set is produced at a very high quality-level to offer a unique and beautiful dice product. The set is safely protected in a foam-filled tin-box with an attached lid. This is a 7 Dice Polyset made of solid metal. The die are colored in antique gold and are of great use in every roleplaying or other dice games. They also work as strong and precious counters in card games. This set is produced at a very high quality-level to offer a unique and beautiful dice product. The set is safely protected in a foam-filled tin-box with an attached lid. This is a 7 Dice Polyset made of solid metal. 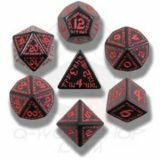 The die are colored in antique copper and are of great use in every roleplaying or other dice games. They also work as strong and precious counters in card games. This set is produced at a very high quality-level to offer a unique and beautiful dice product. The set is safely protected in a foam-filled tin-box with an attached lid.